Is It Time To Modernise Your Skirting Boards? Skirting boards tend to get knocked around throughout their life - maybe it's time for a little TLC. We want our homes to look the best they can possibly be. In this case, there’s a way to fix the ugly or worn out skirting boards and make them how you’ve always wanted. We live in different times now. There was a period where skirting boards were always painted white, you had to put up with certain designs based on your house value and changing the skirting was not an option. Now, you have the power to finally have what you want with minimal fuss. Another change is the use of the material for skirting boards. Once upon a time skirting boards were made from solid wood back in the olden days. While this made the skirting strong and natural looking, the wood would rot over time and keeping it in good condition was not an easy task. Not to mention the wood would get brittle as it got older. Companies today have now turned towards MDF as its easy to produce and can be made to outlast the average wood skirting board. It’s also strong to help protect walls from damage. 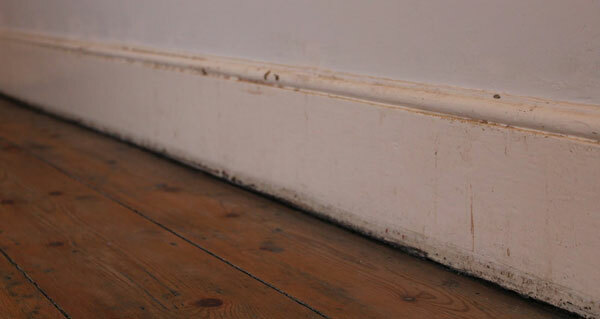 Other signals to also consider on skirting boards are to check for cracks on the skirting, the paint is another. If skirting boards look as if they’ve been painted over a lot over the years, this will in time look unpleasant and will be almost impossible to achieve the desired finish. Other clues include weakening hold on the wall and faded looks. All of these are potential reasons your skirting board might be finally on its way out. Let’s give you some examples now. Most modern houses, here in the UK at least are likely to have standard skirting such as the popular Bullnose design. This skirting board is very simple, only featuring one curve at the top of the profile. Because its so simple and easy to use, its very cheap to buy and explains why this is a favourite with the trade industry. Not to mention it will work in most homes without any fuss too. Another example which is used widely in the UK is the Torus. This has a more traditional look to it which allows it to excel in houses which are very old yet need a new skirting board to take over the old wooden ones. Although it’s a much more complex and interesting shape over the bullnose, it’s still one of the main choices in the UK for companies to use in mainly older houses. So, what is the point of all this? Its to inform you that modern design does not mean follow the current trend or settle for these average skirting boards companies just choose for you. Sticking with what’s in so many homes already just isn’t good enough anymore. Here’s some ideas for how you can make the skirting boards work for your home and make you feel at peace. I’ve mentioned this already but, white is the standard colour for skirting boards and has been for a very long time. This colour will work with most homes however, if you feel differently on that, skirting boards can now be painted. There’s a variety of colour available. There’s pretty much any colour you can choose from. If you feel brave, you can paint your existing skirting a different colour. Please make sure to take great care when painting and inspect your skirting thoroughly for signs of damage and wear. This step is the most important one I feel. You no longer must go with the standard Bullnose or Torus boards. Now, there’s so many designs for skirting boards, it can be somewhat overwhelming. The best way to go about finding designs is to think about what kind of look you are looking for, then looking online or in a local shop to see what you can find. To give examples, the Bullnose is a very simple but easy board to use and live with. The London skirting board however, is full of detail and really suits traditional homes where the skirting boards were made of wood and had unique carvings on them. Another example is the Stepped 3 MDF. It’s step-based looks are striking to look at. As so is the Milan skirting board thanks to its detailed yet modern looking profile. If you are not aware, MDF skirting boards are made up of wood fibres which are then compressed under high pressure to make the skirting board. Now, what’s important here is the finish. If you are buying skirting boards and the finish either looks inconsistent or has an unsmooth like appearance or feels rough on the surface, chances are you are looking at standard grade MDF. This is common in most homes. This can brittle over time and look unsatisfactory not long after. To avoid this issue, makes sure you look for HDF skirting boards. HDF stands for High Density Fibreboards. They don’t cost any more than the standard MDF and more importantly will last a much longer time, thus keeping inconveniences to a minimum. There was a time when skirting boards only came in a certain height, very small heights at that. The issue was overlooked as people never thought to try new heights and it would have been too expensive at the time. Now, you can have skirting boards in any height you wish. Tired of having small skirting boards? Well you can now replace it with huge ones. Another change is the thickness of skirting boards. Like the height before it, skirting boards only came in one thickness size. Not only will a thicker board be stronger, it allows designs to look grander and stand out much more than a thinner board. This will really benefit designs which have detailed profiles on them and help make your home stand out. If you need more floor space or are putting skirting boards in a narrow space, a thinner board is better suited for these situations. As you can see, skirting boards are now flexible and can be changed in any way you see fit. Times have changed and now the opportunity to make your house a home can finally come true.